All transactions are safe and secure with a reliable history in online purchasing behind each of our associates. 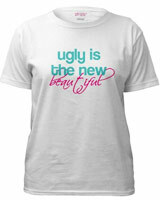 Buy the Ugly is the New Beautiful t-shirt to own Ugly Betty clothing and merchandise. The blue and pink design on the front of this Ugly Betty t-shirt reads, "Ugly is the new beautiful." When the young Latina woman, Betty Suarez (America Ferrera), pleads for an interview at Meade, she is immediately turned away. She is seen as a snotty Kleenex among a staff of lace handkerchiefs. The first Mode Magazine employee that she encounters is immediately ready to discard her. She eventually lands the job and proves to everyone that beauty is much more than what's on the surface. In addition to the Ugly is the New Beautiful tee above, browse the Ugly Betty Clothing Gallery for more apparel like men's and women's clothes, kids shirts or hoodies.